lolwut? Those crazy Japanese are at it again, this time they're putting whole shrimp into a cheesy bites stuffed pizza, tail poking out and all! Mmm, can't you imagine, cheese, shrimp, dough. Super Flavour Combination! 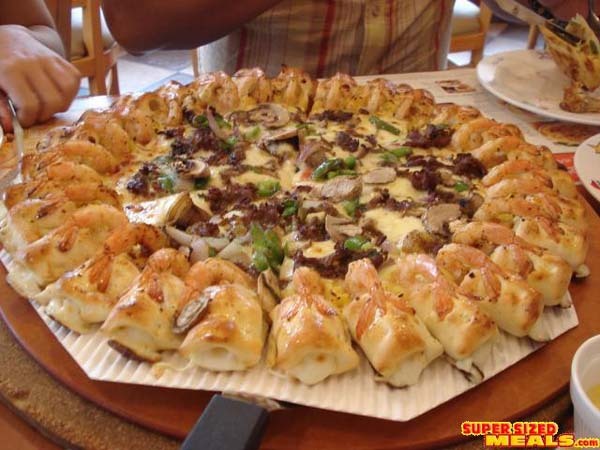 For the pizza lover who also craves shrimp and cheese wrapped in dough, Pizza Hut has created the Whole Shrimp Cheese Bite. Because nothing gets the stomach juices flowing quite as well as a ring of shrimp with tails dangling in the air and heads swaddled in tubes of cheese-stuffed dough. It's actually Korean Pizza Hut who sells these. The youtube commercial is in korean, just thought i would let you guys know.